Two months ago a mysterious phone dubbed Blackshark appeared on AnTuTu with a Snapdragon 845 chipset, tall screen and 8 GB RAM. Later specs got confirmed on Geekbench, followed by an invitation for a launch event on April 13. Thanks to a new leak, coming from the Chinese social media Weibo, we now know a bit more about the phone's design. The phone flaunts dual cameras, paired with an LED flash and a rather overdesigned back. In fact the photo seems to show the phone in some sort of huge case, which could feature some game controls at the front. Blackshark is a Xiaomi-owned company, but the manufacturer’s logo can’t be found anywhere. There is only one big green letter S on the back, giving us Razer Phone vibes. 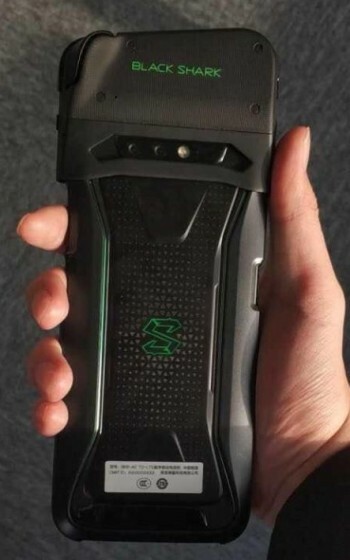 According to the source, the Blackshark is coming with an OLED screen and under-display fingerprint scanner. There are still plenty of unknowns on the Blackshark, but not a lot of waiting remaining until the official launch fills in the gaps. That would be because Nintendo Switch is NOT having additional power draining things like 3G, Background Apps plus their software is optimized for their hardware. It's way different than what a Smartphone does so you're comparing apples to oranges. I wonder what the top looks like without the slip-on controller?